What would be the first confirmed chemical weapons attack of the Syrian conflict (if confirmed, and it's not the first allegation) was reported on March 19, 2013, in Khan Al-Assal, a western suburb or outlying district of Aleppo (on Wikimapia). As usual, both sides in the conflict blamed each other for an attack that killed a reported 25 or 26 to perhaps 31 people with a toxic cloud, and wounded/effected 80-110 with acute respiratory and problems at the least. As usual, both sides blamed each other, and this important alleged event remains incredibly confused and confusing, suggesting we don't know what's going on yet. This hasn't stopped strenuous posturing on the world stage about a firm response, probably against the Syrian government, whatever the truth of the matter. Considering the stakes, the truth of the matter is worth more study and though than it has yet been given. There was also an alleged chemical attack the same day in Al-Otaybah, near Damascus (causing an unspecified number of "martyrs" and "a large number of wounded and many injuries"). While only the event near Aleppo is universally accepted and well-documented, both are worthy of proper scrutiny. This page is a stub with a couple of sections up-front, and otherwise, as usual, being assembled on the discussion page. 3 Who Controlled Khan Al-Assal? 4 No Evidence for Rebel CW Capability? A December, 2013 UN report (PDF) gives an attack time of 7:30 AM (Syrian government) and 7:00 (a witness). 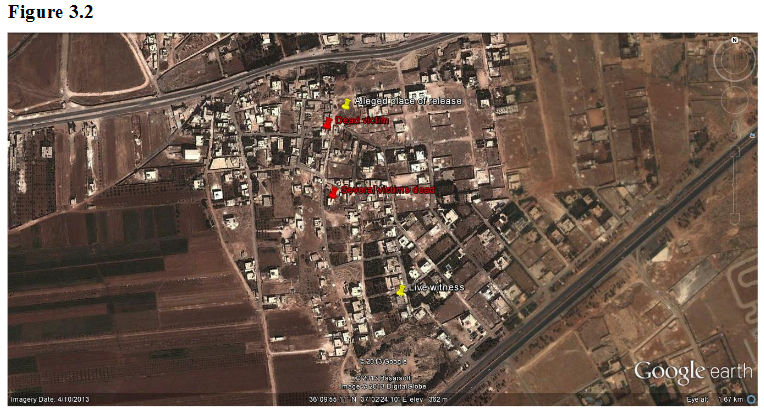 The report heard a single rocket was fired from Kfar De'il, five kilometers north, and landed at the upper yellow pin on the map they provided (below), 300 meters from an army checkpoint, releasing its toxic payload. An apparent breeze to the south-southwest caused fatal exposures at two homes red pins). The army checkpoint is not shown here, but one surviving witness apparently had his or her home indicated. Some evidence suggests chlorine was involved - witnesses described this smell, like bleach. A later UN report heard from witnesses the gas formed "a yellowish-green mist in the air," like chlorine, but had "a pungent and strong sulfur-like smell." They mention it caused itching, besides breathing and heart problems, foaming at the mouth, confusion, pupil consriction and vision problems, and loss of consciousness. Later tests by Russian scientists showed sarin - an impure, improvised sort - was the main poison. The December, 2013 UN report was unable to confirm this, but didn't refute it or offer an alternate explanation. Sarin sems to be the consensus. However, there has been much specualtion on alternate poisons, some if which might remain relevant (see talk page, "The Alleged Agent(s)"). The United Nations, following a request from Damascus and considering competing requests from rebel groups and allied governments, agreed to launch an investigation into the attack. See UN Investigation for a detailed account, or the external article Was the Syria Chemical Weapons Probe "Torpedoed" by the West? (May, 2013, with 2016 updates). Brief summary: Syria's request was frustrated by Western (US, UK, France) demands that the same-day Damascus attack and an older Homs attack must also be investigated, and eventually that the investigators must be empowered like weapons inspectors were in Iraq. Agreements were allegedly reached and then broken through the spring. UN disarmament chief Angela Kane and chosen investigator Ake Sellstrom visited Damascus in late July, on the 26th announcing an agreement to investigate Khan al-Assal. This was already frustrated by a rebel re-conquest of Khan al-Assal on the 22nd, which was followed by a massacre there, perhaps including witnesses. Nonetheless, inspectors finally arrived on August 18. Two days later, they were still in Damascus when the massive Ghouta chemical attack occurred in the surrounding areas, and they switched to investigating this, finding sarin. 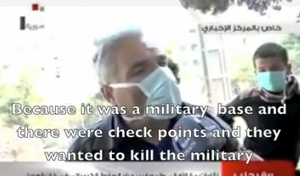 Syrian soldiers were indeed attacked and the site was under Syrian government control at the time. These claims by the Syrian government were not widely accepted prior to the report. The agent was an organophosporous compound. This matches the Russian’s finding of sarin in soil samples, but was also not widely accepted, especially since some eyewitnesses reported a Chlorine smell. This also explains how the report failed to address delivery method (rocket/missile type), and how the attached map of affected area suggests about 20kg of sarin was used. Churkin, Russian representative at the UN, is quoted by RIA Novosti: According to the information at our disposal, the production of unguided projectiles "Bashair-3" was launched in February 2013 by the so-called "Bashair al-Nasr" brigade, connected with the Syrian free army." According to Churkin, soil samples taken at the site of the chemical attack, carried out on March 19, were delivered to Moscow. The studies were carried out in a laboratory certified by the Organization for the Prohibition of Chemical Weapons. It was found that sarin was produced not in industrial conditions, but in a handicraft lab. Russia has enough professional evidence that the sarin gas, used on March 19 (2013) in the Aleppo area, was homemade, made in handicraft conditions, Russian Foreign Minister Sergei Lavrov said. The results of the investigation of Russian experts are available to all members of the UN Security Council. "We also have information that during the notorious episode of August 21 (2013), when chemical weapons were used, and this is an established fact, sarin was also used, and had about the same origin as the substance used on March 19, but only of greater concentration. We transferred this data to our American partners and to the UN Secretariat, "the minister said in an interview with the First Channel. Lavrov also recalled that the Syrian government had provided Russia with materials pointing to the involvement of the opposition in a number of incidents involving the use of chemical weapons. All these materials must be subject to a thorough examination, Lavrov stressed. (See Talk page, Timing for more detail and citations). The days surrounding the the March 19 alleged chemical attack(s), trying to cross the "red line," feature an odd abundance of signals and invitations to get the line crossed. "Red line" of course refers to U.S. President Obama's announcement that any use of chemical weapons by the Syrian government will trigger U.S. military intervention. So might said weapons being in danger of falling into extremist rebel hands, or Hezbollah's hands, or perhaps just being moved around. But actual attacks as a tool of war were the main concern. A december 3 reminder in a speech by Obama was followed by the first (unconfirmed) allegations of such attacks on December 6, 8, 22, and 23, at least. Considering all this, it's clear that the morning of March 19 was an especially poor time for Damascus to cross the red line of its own accord, and a very opportune one for any rebel provocateurs to do it for them. That the attack that occurred then shows that someone seized the moment offered by this confluence of other people's decisions. Interestingly, someone may have planned a three-attack day just then, hitting each of Syria's three largest urban areas. The Khan al-Assal attack at about 7:30 am coincided, apparently to within minutes, with the lesser-known alleged CW incident in Ateibah, Damascus suburbs and with a briefly reported gas release in the Baba Amr district of Homs sometime the same day. This can get a bit complicated. Most sources pass Khan Al-Assal as either government-held (a majority of sources) and thus, more likely to be hit by the other side, or call it a rebel neighborhood (rebel fighters and leaders), making it less likely or ludicrous to be a rebel attack. Official sources specify the government restored order to "parts of" Khan Al-Assal in November, 2012. But in recent weeks, rebels have made gains back in, taking over the police academy and perhaps further, with the government re-establishing almost total control on March 17, two days before the chemical attack. Rebels must have still held the police academy; they say the missile strike was aimed at their position there but missed. But it happened to successfully come down right by a Syrian military target of some sort, if reports that numerous soldiers were killed are true. No Evidence for Rebel CW Capability? One of the core issues in what's increasingly recognized as a distressing "whodunnit" is who could have done it. The rebels are not known to possess Scud missiles, as some rebels themselves describe the delivery system (nor do they have fighter jets, as some other rebels claim). But they do have all kinds of unguided rockets, one of which the Syrian government claims rebels used for their attack. Even at the long range the Syrians seem to have settled on - 45-50 km - the plausibility holds; rebels claim, inconveniently in the circumstances, to have a homemade model of rocket that can go 60 km. Nor are rebels known to possess deadly nerve agents, but the emerging consensus is those probably weren't used. Chlorine gas, which rebels are known to hold plenty of, appears to be an involved agent, perhaps the only one. However, it is not known for sure just what chemicals were used and how they were really delivered. And while there's no known precedent for a rebel-held, gas-emitting warhead, it remains at least possible. With what happened on March 19 far from settled, how the world governments have reacted is of extreme interest. Stated tripwires of global war were allegedly triggered. The text that was here has been moved to the discussion page to let it develop and get sorted-out. Later, the summarized results will be inserted here. This page was last edited on 25 August 2017, at 07:50.